Finally! The Canadian citizen Bashir Makhtal returned home on April 21 after being released from prison in Ethiopia, where he had been wrongly imprisoned for more than 11 years. 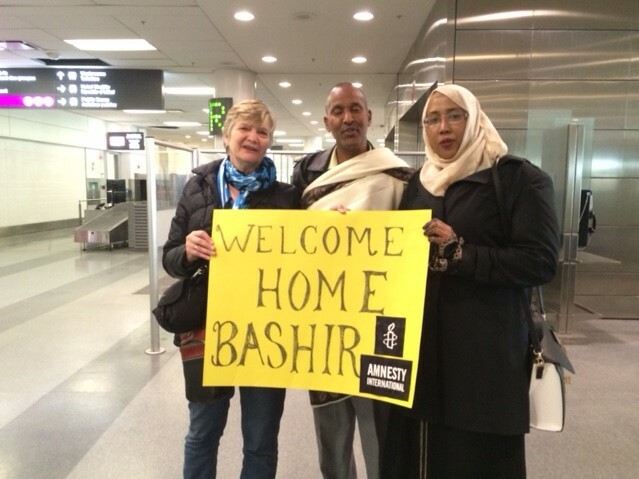 We are thrilled to welcome Bashir, who is now reunited with his loved ones. Bashir’ story begins in nearby Somalia -- a place of seemingly endless conflict and, in mid-2011, once again in the midst of a desperate famine. Yet amid the instability, for many people life goes on. Bashir Makhtal was in Somalia on business in late 2006 when it became the latest battleground in the "war on terror". Together with many others, he fled the fighting and headed for the Kenyan border. Instead of safe refuge, however, they found themselves detained for weeks and illegally transferred to Ethiopia. Eventually, he was accused of providing support to an armed group, the Ogaden National Liberation Front (ONLF). He was sentenced to life imprisonment after a grossly unfair trial in 2009. Bashir was never alone. From the moment of he was arrested, his cousin Said Maktal resolutely led the campaign for Bashir release and return home. “We send our thanks to everyone who signed a petition, wrote a letter or came to a public event about Bashir’s case, including the tireless support from Amnesty International,” affirmed Said. Amnesty International supporters across Canada wrote hundreds of letters and signed tens of thousands of petitions, calling on the Ethiopian authorities for his release. Thank you to each and every person who took time to support this case. You can speak out for other Canadians citizens detained abroad here!